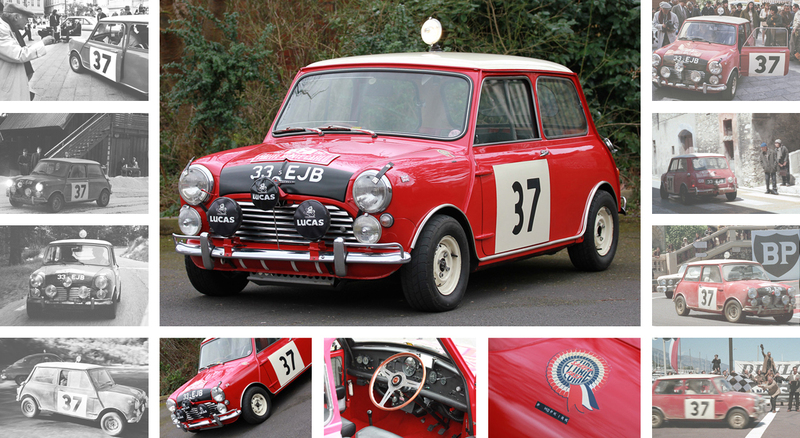 “Better than the car at Gaydon” That was the general consensus when Paddy Hopkirk laid his eyes on this 1964 33 EJB Replica Monte Carlo Rally winning Mini. In fact Paddy was so impressed by the car that he agreed to drive it at the Paddy Hopkirk 50th Anniversary Gala this February. As part of our exclusive hire service, we will deliver this car to your event in a covered transporter on the day of your choice. 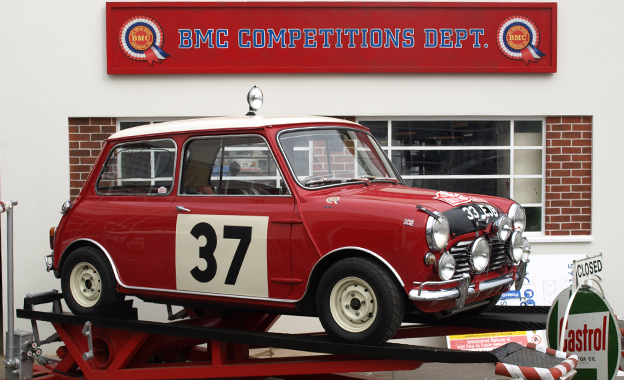 Our staff will accompany and look after the Mini during the duration of the event. Available UK, European or even Worldwide – contact us for further details, pricing and availability of this stunning replica. Take another look at the sparkling little Mini Cooper in my picture today. 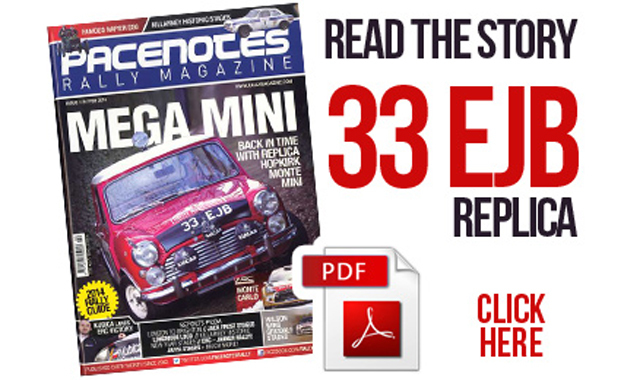 You're wrong, you know, it isn't the Mini in which Paddy Hopkirk won the Monte Carlo Rally 50 years ago to become a house hold name. 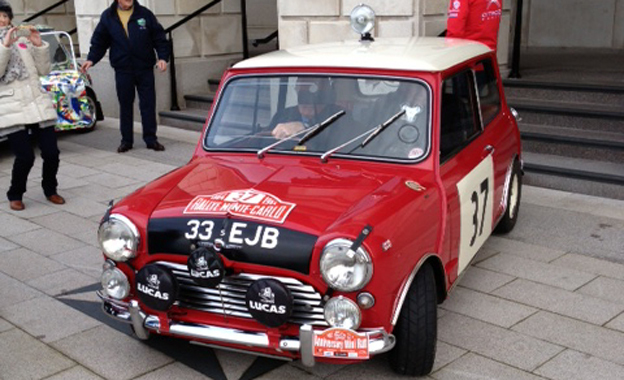 The car is an exact replica of the original, right down to the number plate - 33EJB. It was designed and built over 20 years as a labour of love by the man on the left of the photograph, Graham McConnell. And Graham made a dream came true when Paddy, centre, took him for a drive in the car that isn't quite what it seems. Graham was the navigator, with Hopkirk at the wheel. It could have been Monte Carlo all over again. 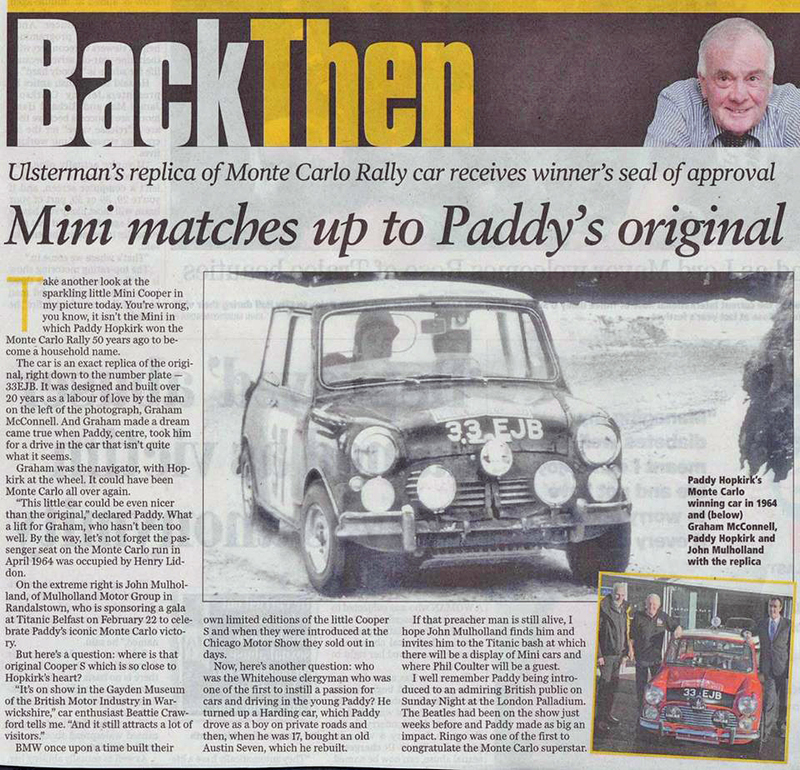 "This little car could be even nicer than the original," declared Paddy. What a lift for Graham, who hasn't been too well. By the way, let's not forget the passenger seat on the Monte Carlo run in April1964 was occupied by Henry Liddon. On the extreme right is John Mulholland, of Mulholland Motor Group in Randalstown, who is sponsoring a gala at Titanic Belfast on February 22 to celebrate Paddy's iconic Monte Carlo victory. 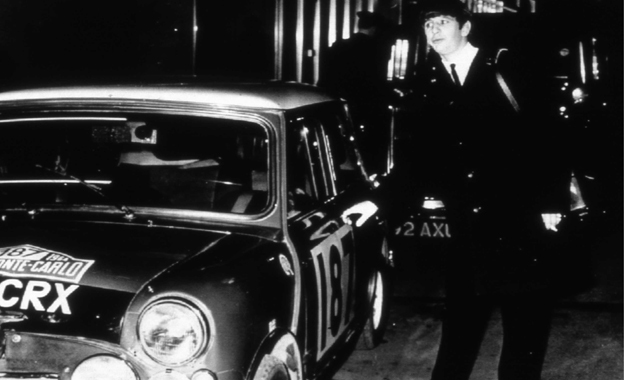 BMW once upon a time built their own limited editions of the little Cooper S and when they were introduced at the Chicago Motor Show they sold out in days. Now, here’s another question: who was the Whitehouse. clergyman who was one of the first to instill a passion for cars and driving in the young Paddy? He tuned up a Harding car, which Paddy drove as a boy on private roads and then, when he was 17, bought an old Austin Seven, which he rebuilt. If that preacher man is still alive, I hope John Mulholland finds him and invites him to the Titanic bash at which there will be a display of Mini cars and where Phil Coulter will be a guest. I well remember Paddy being introduced to an admiring British public on Sunday Night at the London Palladium. 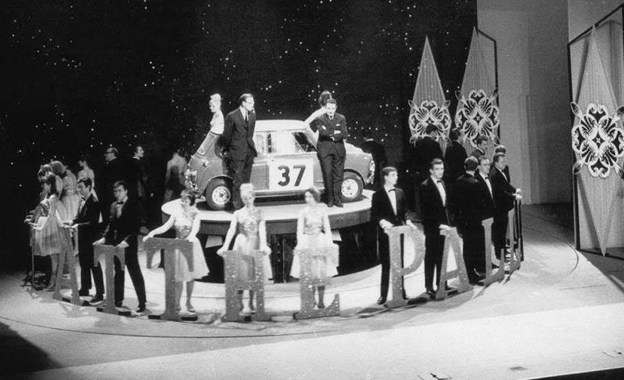 The Beatles had been on the show just weeks before and Paddy made as big an impact. Ringo was one of the first to congratulate the Monte Carlo superstar. I only really met Graham McConnell recently on my press calls in Belfast prior to the Gala. He was to accompany me in his car from Stormont to the City Hall but sadly was not fit enough on the day. Some time ago he realised that probability, so asked me to take him for a run in his Replica Mini some weeks beforehand, which I was delighted to do. The car was marvellous, the real thing and took my memories back some 50 years. Graham mentioned to me that with his terminal illness, he would like me to have the car when he had departed. That offer will stay with me for ever and 33 EJB will now be let out for shows in return for Charity donations. I know Graham was happy with that idea backed by his lovely family Patricia, Sian and Gina too. Graham you will be sadly missed but in the years to come, many people will benefit from your skill, kindness and generosity.